Nothing seems to capture the imagination of scientists and engineers better than the thought of a generator using hydrogen to produce power and water vapor as the exhaust. What a wonderful world this would be if we could just make this utopian model workable. While we are closer to this than ever before, the target date seems to keep on slipping. Twenty-five years ago (during the energy embargoes) the commercially available fuel cell was reported to be about five years off. Today, they are said to be three years off. Keep in mind, all of today's fuel-fired generators can be designed to work with hydrogen as a fuel and they all will produce nothing more than water vapor as a result. We would all sing the praises of a hydrogen economy if we could somehow figure out an economical way of producing the hydrogen in the first place. Never the less, some people would buy a fuel cell at almost any reasonable price just to be the first in their neighborhood to get one. Other commercial and industrial customers want them because they do produce pure DC power. Why is it so difficult to deliver a device that we routinely use in space travel and for other military applications? The answer is simple: run them on pure hydrogen and there is no problem other than price. To run them on any other fuel, such as natural gas, results in all kinds of problems. Why is that? Natural gas is not a manufactured fuel ... it comes from the ground as a mixture of gases including methane, ethane, propane, butane, and other hydrocarbons. It can also have traces of other gases. If natural gas was absolutely pure methane, we would probably have seen final commercialization of fuel cells years ago, but it is not. What has happened instead, is the attempt to design the "chemical processing stage" of the fuel cell (called the reformer) to handle these variations in fuel composition. Looking back, (and hindsight is always 20-20), someone should have probably realized it would be cheaper and more reliable for a utility to deliver pure methane (or even hydrogen) to energy customers than to ask each one to have such a complex chemical plant in the fuel cell itself. Fuel cells are unique energy conversion devices that produce DC power using a chemical reaction. This reaction involves the continuous supply of a hydrogen-rich gas and an oxidizer (normally air). In fuel cells, hydrogen and oxygen are separated by an electrolyte inducing an electrochemical potential between the anode and cathode. This potential is converted into direct current electricity by hydrogen protons moving through the electrolyte (combining with oxygen to form water) and electrons flowing through a separate electrical circuit. The electrolyte is the catalyst for the chemical reaction. There are two to three sections to the finished fuel cell - a reformer to strip out the hydrogen from the fuel, the fuel cell itself, and finally, where AC power is required, an inverter. The major fuel cell differences are in the type of reformer and electrolyte used. Development of a suitable reformer is as major an effort as the basic fuel cell concept. The reformer must convert a range of fuels to hydrogen, at the same time, removing compounds such as sulfur, halides and other trace elements. The delay in bringing the fuel cell to commercialization is the research complications of producing reliable and low cost components for the reformer and electrolyte catalyst. The goals are reliability (a 40,000 hour cell life) at an economic power density (low cost, weight, space with a reasonable heat rate or efficiency). The DOE stated cost goal is to reduce the cost to the range of $400 to $600 per kW. But, that is still a long way off. Currently, there are several different variations on this electrochemical concept. Units of the SOFC design are still in the research phase. 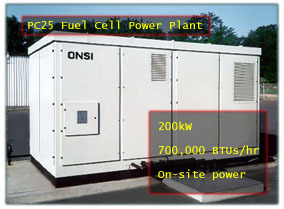 ONSI Corp. is one of several current makers of fuel cells. Their PC25 200kW unit is of the PAFC design. Northwest Power Systems and Plug-Power use the PEM design. Plug Power has stated their commercial production is planned for 2001. M-C Power Corp. and Energy Research Corp. (now FuelCell Energy, Inc.) use the MCFC technology. Other entries are entering the market and include marketing approaches such as the strategic partnership between H-Power (a fuel cell developer) and ECO. While the actual efficiencies are likely to be higher than other distributed generation technologies, the installed costs will be as well. Even at these high efficiencies, the devices will not compete successfully against base-loaded utility generation stations. Not unless and until the value of doing so goes far beyond the wholesale price for power and includes real financial benefits of reduced transmission and distribution loads.